Tech4Society collaborated with other groups throughout the Pittsburgh region to organize an event built around archiving federal data about the environment in a publicly available database. It is illegal for the federal government to destroy data, but it is possible for them to make it difficult for researchers to access that data. In the current political climate, data about the climate and the environment are at a particular risk. The Data Refuge movement seeks to create safe and trustworthy copies of this data outside of the government in a framework that is reliable and accessible for researchers. Pittsburgh isn’t alone in its efforts to archive federal environmental and climate data. This project is part of a national effort with data refuge events taking place around the world. To date there are 43 events that have already happened or currently being planned to rescue data in the United States and Canada. These efforts are part of the Data Refuge movement which seeks to archive data and raise awareness about the existence and use of government data to influence decision making. 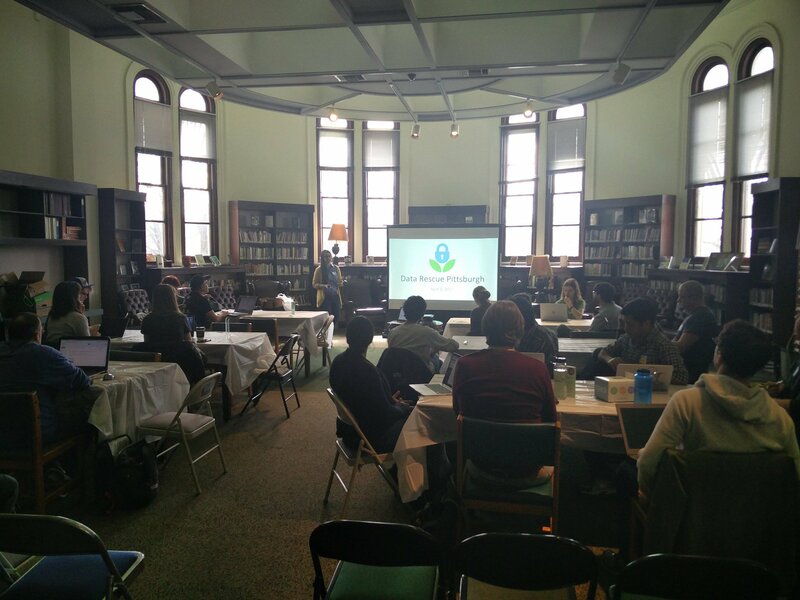 This event was organized by Data Rescue Pittsburgh and it was hosted by Carnegie Library of Pittsburgh. Food was funded by Civic Tech and Data Collaborative project, managed by the Western Pennsylvania Regional Data Center. Preparations: In the run up for the effort Tech4Society was involved in publicizing and recruiting for the event. Tech4Society worked with faculty and graduate students in departments to identify data sets that were under risk. We also worked to streamline and expand upon the description of the participant roles for those that attended. More information about this event, including field notes of the event, are available on the Data Rescue Pittsburgh site. Our archived data is publicly available through www.datarefuge.org. Subsequent events, both general and focused on specific tracks, are in the pipeline. Tech4Society’s work in the climate change and environment area aren’t just focused on data rescue events. We’re interested in more sustainable practices by schools in CMU and opportunities to coordinate with local agencies on technical tasks.